There are 94,000,000 results for the search halloween history. This is a sizeable number. Halloween is very popular - Christmas history has 179,000,000 results, likely the most popular celebration search. However, my search results seem uninteresting, so let me turn to the rich history of the land that the Royal Botanical Gardens in Burlington, sits on. The Royal Botanical Gardens sit on an ancient gravel sandbar known as Burlington Heights. This land feature was created millions of years ago by Lake Ontario's predecessor lake, Lake Iroquois. Burlington Heights was a significantly sizeable 'sand bar' created by this lake. Lake Iroquois's shoreline came through Toronto just a few blocks north of my house at Royal York. Looking at the 'approximate location map', I expect my brother's back garden at Royal York and Eglinton is part of the shoreline - it is a sandy hillside. Burlington Heights separates Cootes Paradise Marsh on the west from Hamilton harbour on the east. It has been a gathering place for thousands of years. Archeological discoveries date from 1000 to 800AD at Princess Point, and it was thought the settlements were from 400BC to 1000AD. Cootes Bay was identified as a bird paradise by Europeans - typically the quote is 'enjoyable for naturalists and sportsmen alike'. One of the most famous paintings of Cootes Bay is by Elizabeth Simcoe, wife of the first Lieutenant Governor of Upper Canada, John Simcoe. It is dated 1796. It is repeatedly described as a paradise, and eventually became part of the name. This area had the largest number of bird species ever found in one place. It is still home to the highest concentration of plant species in Canada. Everything was in abundance: it was designated a fish sanctuary by 1874, and became a formal provincial game sanctuary in 1927. Coyotes Bay gave us nature's abundance, and Halloween gives us the weird and wonderful. 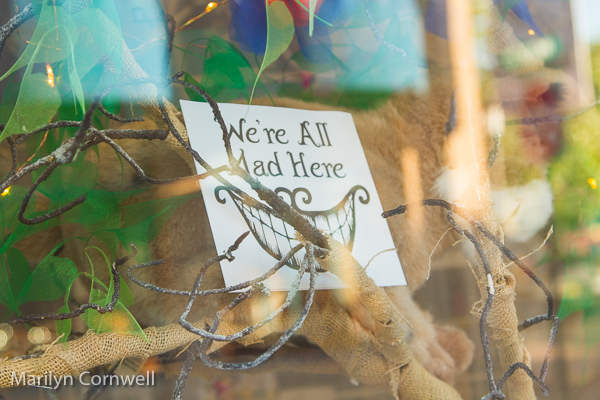 This picture comes from the toy store window in Santa Fe - the quote is one of the versions of "Most everyone is made here" - by the cheshire cat in Alice in Wonderland.